Since we added the 1790 to 1930 US Census records to Archives.com, we have been having fun looking up our favorite celebrities from that time period. We found Transcendentalist philosopher Ralph Waldo Emerson. And, as often happens with this kind of research, what we found piqued our interest and inspired us to learn more. Emerson first appears identifiably in the census in 1850 when he was 47. The censuses taken prior to 1850 only listed the heads of houses, so individuals who didn't own land or were living with friends do not have entries. Born in 1803, Emerson was only a child by the 1810 Census. During the 1820 Census, he was a student at Harvard College, and in 1830 he was a minister and probably lived on church-owned property. After resigning from the ministry, he purchased a house in Concord, MA in 1835, where he lived until his death in 1882. As a landowner, he should have been included in the 1840 census. The closest 1840 record is "R U Emerson" in Concord, close enough that it could be a transcription error. 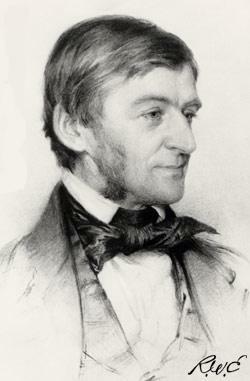 In the 1850 and 1860 censuses, Ralph Waldo Emerson is listed as "R.W. Emerson." This is why it's a good idea to try first initial, shortened forms, or common variants to find someone in the census. "William" was sometimes recorded as "Wm," for example. Luckily, the names of R.W. 's wife and children appear in full, and the residence is Concord, MA, so we know we have the correct Mr. Emerson. His wife's name appears as "Lydia Emerson" in the 1850, 1860, and 1870 censuses but is written "Ledian Emerson" in 1880. It's important to remember that census enumerators sometimes make mistakes or write illegibly, but "Lydia" to "Ledian" was quite a jump. We checked a few biographies and discovered that Emerson proposed to Lydia Jackson in 1835, four years after his first wife, Ellen Louisa Tucker, died of tuberculosis. Emerson started calling his second wife Lidian soon after they married because he preferred the way it sounded in a New England accent. It seems "Ledian" is a case of the census-taker's script being difficult to read, though it remains a mystery why it was only late in their 47-year marriage that she gave her husband's nickname as her official name. Incidentally, we also learned that Emerson also addressed her as "Queenie," "Asia," and "Palestine," though none of those ever made it to the census. Mrs. Emerson's name isn't the only thing that changes throughout the records. The section for occupation is left blank for both husband and wife in the 1850 census. In 1870, Ralph is listed as an "author," and by 1880 he has become a "scholar." Despite being something of an author in her own right, penning the satirical "Transcendental Bible," Lydia/Ledian's occupation is listed as "keeps house," a designation that today seems at odds with her politics that were usually more progressive than her husband's famous lectures. The 1850 and 1870 records also included financial data. Emerson's "Value of Personal Estate" was listed as $5000 in 1850. Twenty years later, his personal estate was up to $18,000, with the addition of $21,500 in real estate. The household list changes over the years as children move out--or in the case of son Edward and daughter Ellen, stay well into their adulthood--and servants move in. By 1870, two "domestics" were listed as part of the Emerson household. With a bit of searching, you can learn surprising details about your own ancestors, too. The census is a great place to start. Who knows where your questions will lead? Do you have any favorite stories from searching the census? Please include in comments below!